Security forces in Brazil have banned masks at Pope Francis's opening Mass at the Roman Catholic World Youth Day festival in Rio de Janeiro next week. More than one million people are expected at Tuesday's Mass, which will be policed by 7,000 troops. The authorities are worried the visit could spark a repeat of June's unrest, when many wore masks in the crowds. An army general in charge of security said people with a "hostile attitude" would also be barred from the area. There were widespread anti-government protests last month during the football Confederations Cup. 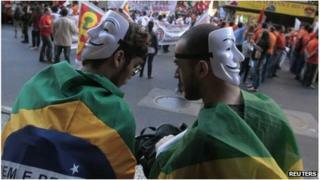 Many of the protesters were wearing Guy Fawkes masks, which have become a feature of demonstrations around the world. In an attempt to avoid fresh unrest, nearly 35,000 security officials are expected to take part in operations during Pope Francis's visit between Monday and Sunday next week. A number of protests during the Pope's visit are already being planned through social media. Brazilians have taken to the streets to complain about the state of public services such as transport, health and education; and about what they perceive as the inefficiency of their politicians. Gen Jose Alberto da Costa Abreu, in charge of security for the Pope's visit, said the authorities would be vigilant at Monday's Mass. "Masked people will be barred from entering. It is not the right space... for a subject with a hostile attitude, wearing a mask, to enter. "We will not allow this to happen," he told reporters. However, he said there would be no attempt to intervene if protests were peaceful. "A person holding a poster is not a threat," Gen Abreu said. Millions of young people are expected to attend the public events held by the Pope, who arrives in Brazil on 22 July. During his week-long stay, he is also expected to celebrate Mass on Rio's famous Copacabana beach, an event expected to attract as many as two million people. When Pope Francis arrives in Rio, he will attend a welcome ceremony in Guanabara Palace. Guests will include Brazillian President Dilma Rousseff. The catholic education institution will be the Pope&apos;s residence during his stay in Rio. The Pope travels to the National Shrine of Our Lady of Aparecida in the city of Aparecida do Norte, the largest Marian pilgrimage centre in the world. He will celebrate a mass there and return to Rio on the same day. As soon as he returns from Aparecida do Norte, the pontiff will inaugurate a special ward for the treatment of drug addicts, built with donations from the Vatican. The Pope will be handed the keys to the city from mayor Eduardo Paes. Later, he will bless the Olympic flags for Rio 2016. Pope Francis visits the community living in the Varginha slum and will make a speech in a local football field. The Pope will greet the participants of the Church&apos;s World Youth Day on 25 July. The next day, they will join him in a Way of the Cross procession at the beach. The Pope receives the confession of five youngsters in a house that was used by Brazil&apos;s royal family members. The pontiff will meet young prisoners. After that, he will deliver the Angelus prayer and blessing from the palace balcony and meet youngsters from the organising committee of World Youth Day for lunch. Pope Francis meets politicians and local dignitaries. The Pope will hold a vigil with the participants of World Youth Day on Saturday evening. On Sunday morning, Pope Francis will celebrate the final mass of the WYD 2013 and deliver the Angelus prayer and blessing once again. On his way to the airport, the pontiff stops in Riocentro, the largest convention centre in Latin America, to meet the WYD volunteers. In his last engagement in Brazil, the pope will make a speech in a farewell ceremony at the airport.